A washing machine is one of the best appliances to have as it can make our lives more convenient. Traditionally, they are bulky and consume a lot of space. If you are looking for smaller alternatives or for those that can be easily moved from one place to another, a portable washing machine can be the perfect solution. You can even bring it in the campsite or in a mobile home. To help you make a decision that you won’t regret, we have written this guide on the best portable washing machine to buy. We looked at the options and selected the products we believe can provide the best bang for the buck. By the time that you are finished reading, we hope that you will be able to make the right choice. Below is a table that summarizes the features of some of the products you might want to consider, followed by an in-depth review. If you want a sleek and portable washing machine, this is one option that should be on the top of your list. It measures one cubic foot and has a load capacity of six pounds. The main material for the tub is stainless steel, which can be gentle even on delicate fabrics. Regardless of what you need to put in the machine, there is a setting that is appropriate for your laundry. There are three wash cycles and three water levels, which are all controlled electronically. This is beneficial in terms of convenience. This can also be a great choice for those who would like an emphasis on energy-efficiency. Under normal use, it will only consume 214 kilowatts in a month, which is pretty much better compared to many others within the competitive landscape. Meanwhile, if you are concerned about ease of use, there is no need to worry. There are electronic controls that will make it easy to operate. It also comes with LED indicators so that you can easily monitor the progress of your laundry. If you will be using the washing machine on an uneven surface, you will be happy to know that it will remain stable regardless of the load. This is possible because of the adjustable leveling leg. It is not only compact and lightweight, it also comes with casters. The latter will make it easy for you to move it around as there is no need to have it carried. It will roll smoothly on the ground. Lastly, the manufacturer is offering a one-year warranty on parts and repairs should the product prove to be defective. For the warranty to be valid, however, you have to make sure that the problem is not a result of your negligence. Another top choice within the product category, one of its top features is its quiet operation, which is possible when you keep the load to a minimum or follow the load capacity indicated by the manufacturer. To provide you with more choices when washing your clothes, this machine comes with six fully-automatic settings. You can choose from normal, quick, jeans, cotton, air dry, and anti-wrinkle. You do not have to be left guessing on how long you need to wash your clothes as each cycle will be automatic depending on what you will choose. You also do not have to exert too much effort on its installation, even if you are a beginner. The product comes with a complete kit. There is a quick connect adapter included, which you just have to connect to the faucet for the supply of water. No need to have an advanced technical knowledge to complete the required assembly. Another plus for this portable washing machine is the transparent viewing lid. You can easily see the progress of the washing, which is also possible with the LED indicators. At the back of the machine, there are two rollers. With this, you can have it easily rolled if you need to have it transferred to a different location. This portable washing machine has a capacity of 16 pounds, which is pretty much great considering the fact that it has a compact size and that it is lightweight. Lastly, the tub is made of durable stainless steel. This is not only long-lasting, but can also resist corrosion. Even the actual body of the machine is known for its longevity. From the seven products that are mentioned in this post, this is one of the most affordable, which makes it a great option for people who are on the lookout for a budget-friendly alternative. However, because of its economical price, do not expect much in terms of its construction as it is made mostly of plastic. The plastic construction might raise a red flag in terms of durability, but it is actually a good thing that it is lightweight. Because of its minimal weight, you will not have difficulty in moving it around, even if you have to take it with you when camping. The twin tub design is one of its best features. Despite having two tubs, the machine is still compact and space-efficient. One side is dedicated to washing and the other side functions as a spinner. Because of its dual functions, there is no doubt that it can provide bang for the buck. More so, it has a motor that runs at 1,300RPM, which makes it able to do more in a little time. This is quite amazing to think that the machine comes with a compact size. This portable washing machine has a combined total capacity of 13 pounds – eight pounds for the washer and five pounds for the spinner. When using this product, the washer can function continuously for up to 15 minutes and five minutes per load for the dryer. Right out of the box, it already comes pre-assembled. This means that there is no need to worry about its installation as it is ready to be used. The controls are pretty much basic, so there is nothing much that you need to figure out. Similar to the model that has been mentioned above, this is another option that is ideal if you are on a tight budget. There is a reason for this – it is operated manually. You do not need to use electricity. This means that it is excellent in terms of portability since you can bring it almost anywhere and use it even when there is no electricity. Rather than relying on electricity to wash your clothes, this product uses a hand-crank. This means that more effort will be necessary on your end. All that you have to do is to load the clothes, add water, and turn the crank. Compared to traditional washing machines, it is able to save up to 90% water, which also makes it good for the environment. Another benefit of being non-electric is that it is a lot gentler on clothes. You do not need to worry even if you are washing silk and other delicate fabrics since they will not be easily damaged. This also means that your clothes will last longer. If durability is a major concern, you have another good reason to pick this product. It has no motor or internal moving parts, which is one of the reasons for its longevity. Many may worry about the handle, thinking that it will snap quickly because it is often cranked. Nonetheless, the handle is designed in such a way that it will be long-lasting. Even if it is a cheap product, it comes with a warranty that lasts for three years, which is better than most of its competitors with only one-year warranty. Made by one of the most popular brands for portable washing machines, this is another product that deserves your attention. It is 2.65 cubic feet and can handle a load with a weight of up to 8.8 pounds. The unit weighs only 44 pounds, which makes it great in terms of portability. It is lightweight, and hence, you will not have a problem in moving it around. While it is portable, there is also an option to have it installed in a permanent location. There is already a wall mounting kit included upon purchase. The product comes with a stainless steel drum, which is known for being durable. The drum can also handle even sensitive fabrics, which will make your clothes last longer. In front of the unit, there is a transparent lid. This is also where you should open the washing machine, unlike many others that have a top-loading design. One more thing that is well-loved about this product is the removable lint filter. It is going to be almost effortless to remove and replace. However, if there is one important thing to note about this product, it would be that it is 110 volts. This means that drying might take quite a longer time. Some of you might have a problem with this, but it is also a good thing that the drier comes with four temperature settings, providing you with the option to choose which one is best. 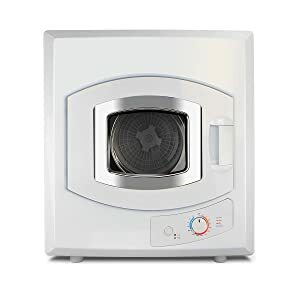 Lastly, the manufacturer is offering a one-year warranty for this washing machine, which is pretty much the standard within the product category. When looking for a portable washing machine, you should definitely settle with one that is user-friendly. This is one reason why you should choose this product. All that you have to do is fill it with water, choose the desired setting, and wait. This is definitely going to make your life more convenient. With a weight of only 28 pounds and a space-efficient design, this also fares well when it comes to portability. Whether for a small apartment or an RV, this can be a great choice. The best thing is that you will not have a hard time moving it around. It is not just a washer, but also a spinner. The larger tub is for washing. Once done, transfer it to the smaller tub, which is for spinning. This easily drains the water out of the clothes so that they can be dried easily. 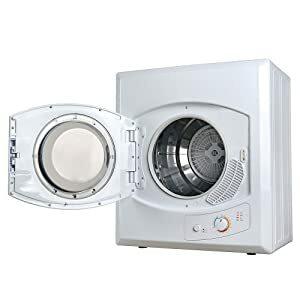 In terms of design, like most washing machines, there is an inlet hole that you can find on the top part of the unit. This is where you will insert the hose so that you can have it directly filled with water. There is also a hose that will make it effortless to drain water once you are done with your laundry. If you are worried that the product will become defective, the manufacturer is offering a one-year warranty. This may not be enough to convince a lot of users, but this is already pretty good as this is the standard. Within such period, they will offer free repairs, but you have to make sure that the issue is not your fault. This may be one of the least popular from the seven products that are mentioned in this post, but this is also one of the most affordable, making it a great choice if you do not want to spend too much for a product that can deliver decent quality. Similar to most of its competitors, it is a two in one unit – a washer and a spinner. The washer has a power rating of 300 watts and a capacity of 8.8 pounds. On the other hand, the dryer has a power rating of 150 watts and capacity of 4.4 pounds. The simplicity of this product is another thing that makes it a great choice. For instance, its installation will not require a lot of time and effort on your end. Even if you are using it for the first time, you will be able to do things easily, especially because of the clear instructions that are provided by the manufacturer. It comes with a built-in 300-watt pump, which is the one responsible for providing it with impressive power despite its compact size. However, it is still not as powerful as the higher end options that you can find in the competitive landscape. On the upper part of the unit, near the lid, there are three dial controls, making it easy for you to set the desired setting. The one on the left-most part is for the timer, the one in the middle is for the wash setting, and the one on the right is for the spinner. You will hear an audible click after selecting the desired function by turning the dial. Now that we are done tackling some of the best products that are available, let us go to another important section of this post. This part will tackle almost everything that a buyer needs to know, such as the factors to consider and why you need to have this appliance in your life. Affordable: Most of the traditional washing machines are expensive because of their wealth of features, most of which may not be needed. 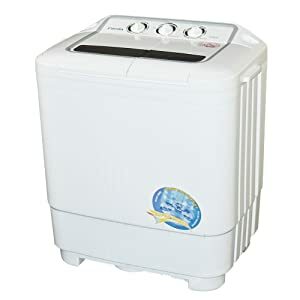 A portable washing machine, on the other hand, comes with a more affordable price since it is smaller and it has only the most important features – usually washing and drying or spinning. Space-Efficient: One of the main benefits of these washing machines is that they have a space-saving design. They are sleek and compact, which is also why their capacity is minimal. Because of their size, this is the perfect choice if you are living in a tiny apartment, dormitory, or RVs, among other places where there are space limitations. Lightweight: Because of its size, these washing machines are also lightweight. You can easily transfer them from one place to another or bring them outside of home when necessary. Some models also have caster wheels for ease of movement. User–Friendly: The simplicity of the portable washing machine is the reason for this. They lack the bells and whistles that you can find in bigger washing machines. You do not need to exert a lot of effort to use one. Multipurpose: This is a benefit that will depend on the model that you will choose. In most cases, it is not only for washing clothes, but also for spinning and drying. Despite its compact size, it can prove to be a versatile appliance. Manual: This is an unusual choice, but a lot of people prefer it when they have a limited budget. It is human-powered. More often than not, there is a hand-crank or pedal that will trigger the movement. It requires more effort to use. Because no electricity is required, you can use it anywhere. Electric: The more common of the two types, this will use electricity to wash and dry your clothes. It is better in terms of convenience as all that you need to do is to load the clothes, enter the desired setting, and wait until it is done. 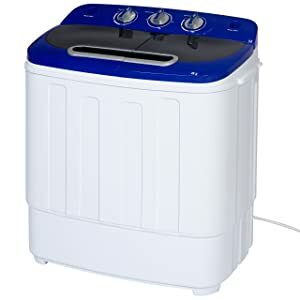 Front-Load Washing Machine: In this type, the drum is in a horizontal position. Therefore, when it is spinning, the clothes will be pulled out of the water and then back. It is more efficient in terms of water consumption. There is also no central agitator, which will make it possible for you to load more clothes. 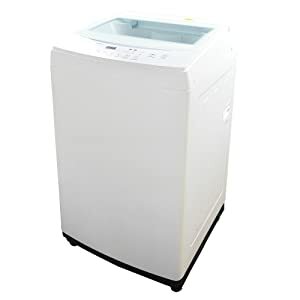 Top-Load Washing Machine: This is the more traditional of the two types. It comes with a central agitator, which is the one that does the washing. It consumes more energy and water, although newer models have been improved to make them better. Versatility: A portable washing machine can be versatile, depending on the type that will be chosen. In this case, it must be able to do not only washing of your clothes, but also spinning, removing excess water before you hang them to dry. More advanced models can also dry the clothes directly after they are washed. Ease of Use: No one has the patience to deal with complications when it comes to washing clothes. After all, the reason why we opt to use a washing machine is to make the task of doing laundry a lot easier. With this, as you try to weigh the pros and cons of the possibilities, you have to look at how easy they are to use. There are different things that will be indicative of ease of use. One that should be looked at would be the controls and how you will be able to set the desired function. It will also be good if there is a LED indicator, making it easy to monitor the progress of your laundry, such as the time that is remaining before it is done. Another thing that you have to evaluate when it comes to ease of use would be filling with water and having it drained. There should be a water inlet that is in a strategic position. The drain hose is also important to empty the tub of water. 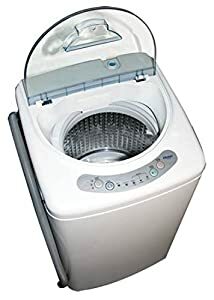 Durability: If you want the washing machine to last long, you have to take a look at its overall construction and the materials that are used. The exterior is commonly made of plastic, which is lightweight. See to it that it is strong enough so that it won’t easily break. The tub, on the other hand, is usually made of stainless steel. Size: We all know that portable washing machines are compact. Still, you have to think about their specific dimensions and see to it that they will be suitable on the space where they will be used. The larger one usually has two tubs – one for washing and another one for drying / spinning. Look at the exact dimensions and cubic feet to determine its size. Capacity: Usually, the larger is the washing machine, the larger is its capacity. Here, we are talking about how much the machine will be able to wash in one go. Most manufacturers will state this by providing how many pounds of clothes can be washed or dried. The capacity is important to protect the motor and make sure that there is enough room for movement in the tub. On average, a washing machine with a size of one cubic foot will be able to handle about six pounds of clothing. Portability: Of course, they are already portable, which is exactly why they are called portable washing machines. However, their portability can still depend on a number of factors, such as size and weight. To become more portable, it will also be good if they are equipped with casters, which will make it easy to have them moved around when there is a need to have it transferred in a different location. Energy Efficiency: If it is an electric model, you also have to think about the amount of energy it consumes. There are some models with Energy Star Certification, which means that they use less electricity in the absence of compromising the outcomes. Aside from electricity, see to it as well that the product is designed in such a way that it will use less water. Noise: A lot of large washing machines are annoying because of the loud noise that they create when they are running. With this, as you evaluate the options that are available, pay attention to their noise. In the technical specifications, look at the decibels as it will be indicative of the noise that it will create. Some are also equipped with a noise damper, which will lessen the noise that is created by the machine. Safety: Even if they are small, these washing machines can pose safety threats. Look for those with standard safety features. One of the most important is the lid to have an alarm when it is accidentally opened when running. An automatic draining feature will also be good to avoid accidents. Design: This may be one of the last things that many of you will consider, but it is also great to evaluate the options on the basis of their aesthetics. It will be good if the style will complement the look of the space where it will be placed. The design, however, should not only be pleasing to the eye, but should also be functional. Warranty: What will happen if the portable washing machine becomes defective? What if there are parts that will be replaced? Will the manufacturer cover the labor? In all these cases, the warranty will be an important buying consideration. Most of the products are covered by one-year warranty and there are also some wherein the warranty coverage can be longer. 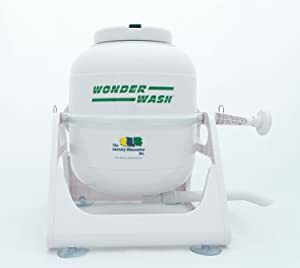 In sum, the best portable washing machine is an essential investment if you live in a small apartment or if you need an appliance that will allow you to wash your clothes anywhere, even when you are on the road or a campsite. There are many options available, but you need to be responsible enough to go through each of them and make the right decision.